A specter is haunting the Left, the specter of Karl Marx. In June, my friend Joanna and I presented a workshop at the 2010 US Social Forum, an enormous convergence of progressive social movements from across the United States. The USSF is "more than a conference", it's a gathering of movements and thinkers to assess our historic moment of economic and ecological crisis, and generate strategies for moving towards "Another World". 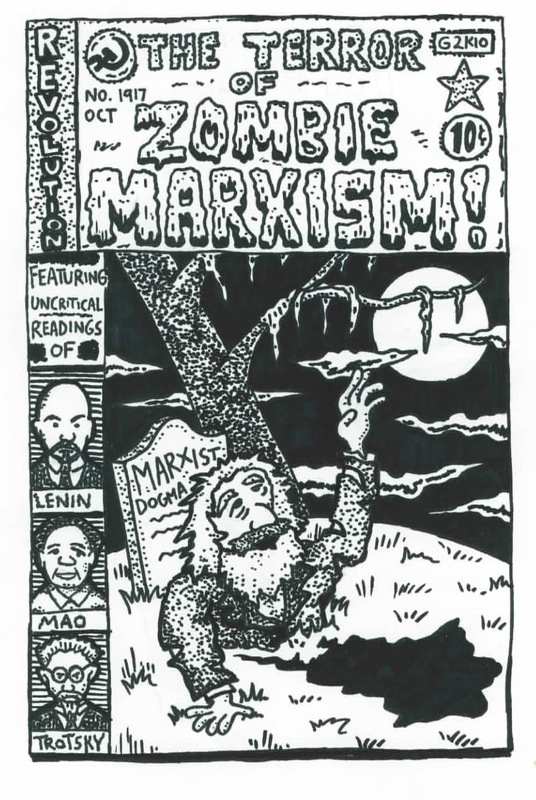 Despite the lively audience, I knew that somewhere lurking in that cramped, overheated classroom was the unquestionable presence of Zombie-Marxism. 1 And I knew it was only a matter of time until it showed itself and hungrily charged at our fresh anti-capitalist analysis in the name of Karl Marx's high authority on the subject. It happened during the question and answer period. A visibly agitated member of one of the dozens of small Marxist sectarian groups swarming these sorts of gatherings raised his hand to speak. I hesitated to call on him. I knew he wasn't going to ask a question, but instead to speechify, to roll out a pre-rehearsed statement from his Party line. I called on others first, but his hand stayed in the air, sweat permeating his brow. Perhaps by mistake or perhaps from a feeling of guilt I gave him the nod to release what was incessantly welling up in his throat. "I don't agree with this stuff about ecological limits to growth. Marx wrote in Capital that the system faces crisis because of fundamental cycles of stagnation that cause the falling rate of profit""
With the resurrection of Marx's ancient wisdom, a dangerous infection was released into the discussion. Clear, rational thought, based on evaluating current circumstances and real-life issues in all their fluid complexities and contradictions, was threatened by an antiquated and stagnant dogma that single-mindedly sees all situations as excuses to reproduce itself in the minds of the young and vital. Marx didn't articulate his ideas because they appeared true in his time and place. No. The ideas are true because Marx said them. Such is the logic. If I didn't act fast, the workshop could surrender the search for truth to the search for brains. I would have to cut this guy off and call on someone else. I knew better than to try to respond to his "question" it would only tighten his grip on decades of certainty and derail the real conversation. Unfortunately, there is no way to slay a zombie. Regardless of the accuracy or firepower in your logic, zombie ideas will just keep coming. The only way out of an encounter with the undead is to escape. I motioned my hand to signal "enough' and tried to raise my voice over his. "Thank you. OK, THANK you! Yes. Marx was a very smart dude. OK, next?" Karl Marx was without a doubt one of the greatest European philosophers of the 19th century. In a context of rapid industrialization and growing inequality between rich and poor, Marx pinpointed capitalism as the source of this misery and spelled out his theory of historical materialism, which endures today as deeply relevant for understanding human society. He emphasized that capitalism arose from certain economic and social conditions, and therefore it will inevitably be made obsolete by a new way of life. For me, what makes Marx's work so powerful is that he told a compelling story about humanity and our purpose. It was a big-picture narrative of economy and society, oppression and liberation, set on a global stage. Marx constructed a new way of understanding the world a new world-view which gave meaning and direction to those disenchanted with the dominant capitalist belief system. And in crafting this world-view, Marx happened to do a pretty good job wielding the tools of philosophy, political economy and science, aiming to deconstruct how capitalism functions and disclose its contradictions, so that we might overcome it and create a better future. Giving Thanks to Inspiration - Review of "The Great Turning: From Empire to Earth Community"